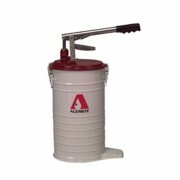 Alemite Manual Bucket Pumps - 7181 Series. Adjustable lever adapts the pump to lubricant type and operating conditions. Includes 2 check valves – one at the bottom located on rod, and a second valve mid-way in the tube for increased volume. These manual bucket pumps offer variable pressure between 2,500 and 5,000 psi. 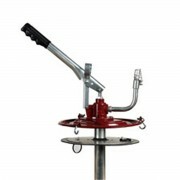 Adjustable lever has three positions to adapt pump to lubricant type and operating conditions. 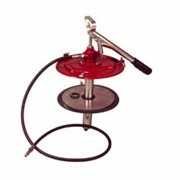 The Alemite 15000 PSI/1034 Bar High-Pressure Bucket Pump 6713-4 is designed to deliver bulk fibrous and heavy-bodied lubricants. It can also pump light- bodied greases. 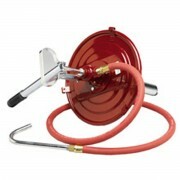 The pump develops 15,000 psi (1034 Bars) and delivers approximately 1 ounce (28.4 g) of product in 16-strokes. Alemite Manual Grease Pumps are simple to operate and require no electricity or compressed air. We offer a wide variety of models to fit 25-lb. pails up to 400-lb. drums, plus a full line of accessories. 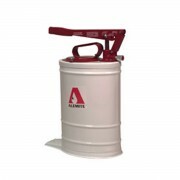 Alemite Grease Loader Pumps are used to fill loader fitting equipped grease guns quickly and efficiently. Loader Pumps reduce the chance for contaminants to be introduced into the grease container and lubrication points. 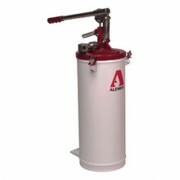 Alemite Oil Dispensing Pumps are compatible with oils and gear lubrication. Attach directly to original container. 2 lever positions to adjust delivery rate.